The Annual Spring Festival 2019 will take place from 25th February - 1st March 2019. 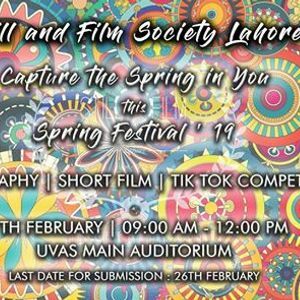 More than 40 competitions will be held in this course of time among which the Still & Film Society Lahore will be organizing a competition of Photography , Short Film and Tik Tok compilations. 27th February 2019 is the date and time is from 09:00 AM to 12:00 PM at UVAS Main Auditorium. 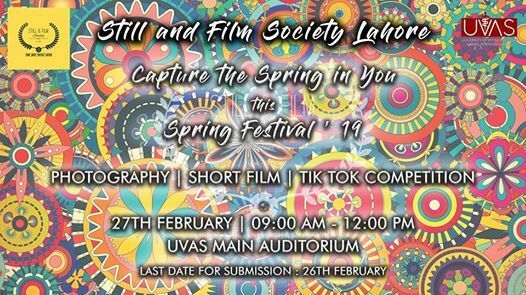 You are requested to kindly participate from your departments for winning the annual trophy of spring festival. developed and printed on a photographic paper from a color lab). It will result in disqualification. or Piccasa or any other software. It will result in disqualification. d) The photograph must not contain any caption or name or class etc. e) It should not violate the copyrights law i.e it should not be copied from google or the work of someone else. f) The pixels of the photograph must not be blurred or broken. It will result in disqualification. g) Light settings , ISO , color contrast and curves can be corrected to a considerable proportion. along with the name class and degree of the contestant. i) There are no specified limits of the number of photographs given by a department. j) The decision of the judges will be considered final. k) The photograph to be entertained must not have any violent/harassing/negative/abusive/ unethical factor. a) The short film must not exceed the maximum running time duration which is “6 minutes and 30 seconds. b) The film to be entertained must not have any violent/harassing/negative/abusive/un ethical factor. c) The film must not contain any watermark which is irrelevant. d) The film must not be cropped or over edited. e) Copy right claims will lead to disqualification. f) The cast and crew of the short film must be mentioned. g) The director and DOP of the film must be present for critics and decision. h) The wardrobe and theme of the film must be ethical. 10 can be entertained from a single department provided that they fulfill the requirements as per mentioned.j) The core team of SAF will select the short films to be entertained if problem persists. k) The decision of the judges will be considered final. a) There is no particular theme / story for the Tik Tok Video. b) The maximum limit of a single Tik Tok Video is 1 minute. d) The background music of the Tik Tok Video must be audible and clear. e) The decision of the judges will be considered final. 2019 , 06:30 PM. After this deadline no entry shall be entertained. Submit the contents before the deadline.  The deadline is clearly mentioned above. Nutrition) and the leading body from faculty is Prof. Dr. Aneela Zameer Durrani.  All our judges (three) and our guest of honor, will be notable and neutral.